After taking a summer break from writing, I am ready to crank this wildly popular and thought provoking blog back up! Today’s topic is self promotion! Kidding, of course. As a pastor of an evangelical church in the United States, I am constantly aware of the impact of the American culture on the local church. One of the reasons our church refers to our “services” as gatherings is because of this awareness. When we think of the word service, we immediately think of someone serving us. We go in to our local McDonald’s and complain if someone doesn’t wait on us after about 45 seconds at the counter. We sit down in a restaurant and have our night ruined because the waiter/waitress did not acknowledge us after 2 minutes. We pay others to serve us and when they do not do it to our preference, we complain, groan, or remove our business. “God exists to serve me.” Dangerous declaration. What’s interesting is that this way of thinking continues to bleed over in to the local church. When you ask people leaving a church for their reason, the number one response is, “it just wasn’t meeting my needs.” And this is nothing new. This is not a new insight. In fact, many writers and pastors are currently decrying the consumeristic nature of modern churches. 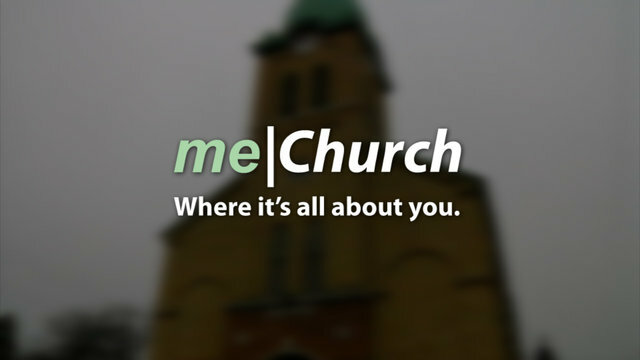 I recently saw a video called “Me Church.” It was a spoof of an ad for a local church that was willing to do anything and everything to keep people happy. One girl wanted her car detailed while she was in church. One guy wanted Super Bowl tickets. It was absurd but the point was well made. But there is more to this than simply trying to “get the church to meet my needs.” The church is referred to as the Body of Christ. In other words, the local church is the physical extension of Jesus Christ to a disconnected world. When someone is with a local church, it should be as close to being with Jesus as humanly possible. The interesting thing is that when followers of Jesus expect a local church to “meet their needs,” what they are really saying is that God exists to meet their needs. Now, we would never say that out loud. But think about it: when a person shows up week in and week out and expects the church to meet his needs, he is essentially looking up to heaven and making sure God knows His place. “God, your job is to serve me and make me happy. And if you don’t, well then I might just leave you. So get to it.” Dangerous declaration. All throughout the gospels we see Jesus meeting needs in the cities he visited. He always had a deeper plan. He would meet a physical need in order to then meet the deeper spiritual need. The church, as the physical extension of Christ, should be about the same work. Once someone crosses the line of faith and becomes a Jesus follower, it is then his/her joy to meet other’s needs in order to spotlight Christ even more. It’s a “you first” mentality. But when a group of people who call themselves “disciples” think, “yep, you’re right: me first,” we may as well look in to the sky and complain when God doesn’t get to our table to wait on us after a minute or so.